ID is required for Senior, Pensioners, and High School tickets. Excludes public holidays & Digital 3D sessions. Some new release exclusions may apply from time to time. 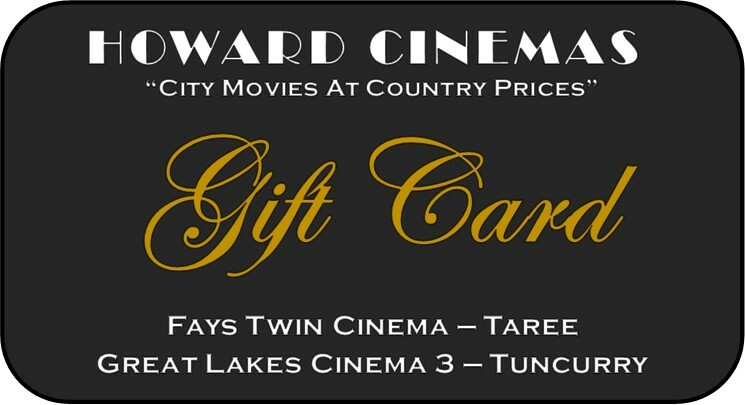 Howard Cinemas Gift Cards are available from the Box Office. Gift Cards can be charged with $20, $30, $50, $70 & $100 worth of value. Gift Cards are valid for 12 Months from the date of purchase and can be used at Great Lakes Cinema 3 - Tuncurry or at Fays Twin Cinema - Taree. Howard Cinemas gift vouchers can be purchased from the boxoffice and are valid for 3 months from date of purchase. If desired, 2D value gift vouchers can be 'upgraded' with the payment of an additional $3 (per voucher) at the box office upon redemption, which will allow usage to Digital 3D. You can add a pre-selected candy bar value (for example, $10) onto each voucher, or specific candy bar items to a voucher, if you so desire for additonal charge. In the 6 weeks leading up to Christmas, Howard Cinemas offers specially printed Christmas Gift Vouchers. These special vouchers can be used with any film, any day and expire 3 months after Christmas Day, making them an ideal gift. If desired, vouchers can be 'upgraded' with the payment of an additional $3 (per voucher) at the box office upon redemption, which will allow usage for a Digital 3D title.